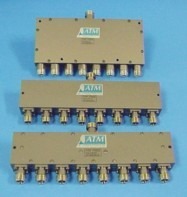 ATM manufactures a wide variety of Coaxial 2 Way, 4 Way, and 8 Way Power Dividers / Power Splitters / Power Combiners with Type-N connectors to meet or exceed your design specifications. We offer models for octave band, multi-band, wideband, ultra-wide band and special band with Type-N connectors. We also manufacture a complete line of SMA RF Power Dividers / Power Splitters / Combiners. Please call us to discuss your power divider / power divider / power combiner requirements with one of our design engineers.